Easily clean between spaces, braces and dental work. 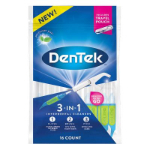 DenTek Easy Brush Standard flosses and cleans hard to reach trouble spots. 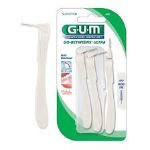 Great for cleaning around braces, bridges, and other dental work. The only interdental brush on the market with an advanced fluoride coating. Insert between teeth, interdental spaces, or dental appliances. Use a soft back-and-forth motion to remove plaque and food particles.